Teaching group exercise in gyms has for the last 11 years been a regular part of my weeks in London. I have permanent group indoor cycle classes (‘spinning’), Body Balance (a Les Mills Programme) and Yoga classes for various London gyms. It is a great complement to photography which can be quite solitary – behind the camera at a wedding, followed by days in front of the computer editing. I first became a fitness instructor because I fell in love with spinning – the combination of high energy, dance music and cycling had me hooked from my first class. My interest in yoga came later, but now is an essential part of my life. 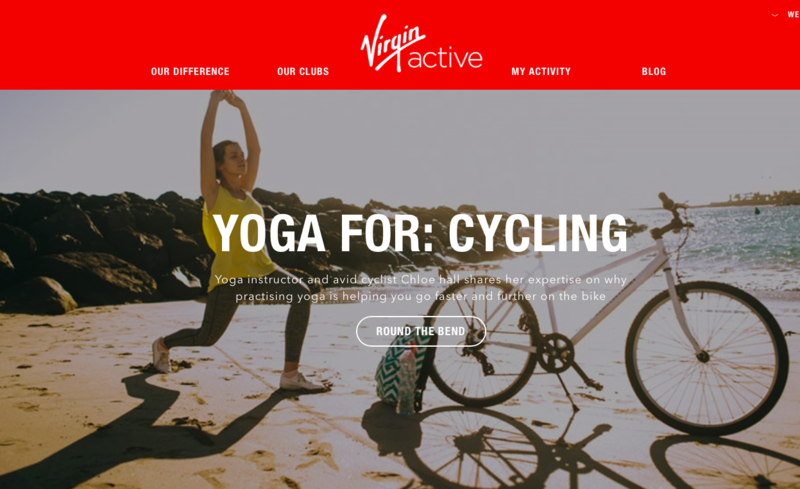 At some point I’ll write more about my fitness journey, but for now I just want to post an article that is on the Virgin Active blog that I co-wrote on the benefits of yoga for cyclists. Look at the aerodynamic position of any pro cyclist and you’ll see similarities to the steady posture of a seasoned yogi. Carefully position limbs, a rock-solid core and relaxed breathing – the two have more in common than a mutual love of lycra. It was because of this she turned to yoga. As you cycle your hamstrings, quads, hip flexors and glutes are under constant stress which causes the muscles to shorten over time. Tight, unforgiving muscles work to pull your body out of alignment and significantly increase the risk of injury. Yoga remedies this by lengthening muscles and taking them through a full range of movement – something you rarely get in the saddle – and increasing flexibility. The forward folds, downward dogs, lunges and twists in a yoga class will help promote muscular balance and healthy movement around the joints. Whatever the variant, it’s tough not to feel a little looser. Chloe recommends poses that compliment your position on the bike by reversing the movement. As your shoulders are hunched forward, try poses that will bring your shoulders back and stretch across your front such as camel pose, hero pose and upward facing dog. Whilst the initial appeal to cyclists may be improved flexibility and reduced chance of injury, Chloe stresses that there is so much more to yoga, “yoga can help build strength in your key cycling muscles, and holding your entire body weight in yoga balances challenges the whole of your body, plus the steady breathing in a yoga class will help calm the mind.” But yoga is also a mental discipline – holding a posture when it gets physically challenging is no different to a huge hill climb or interval training session where your mind is screaming at you to stop – can you breathe into the discomfort and work with it rather than react to it? able to do gymnastics or touch our toes in order to do yoga – we don’t.” The philosophy is that everybody is different but we can only do our best, today, and that’s absolutely good enough to make the most out of yoga.